We never see any human do any kind of job on the Axiom, except for the Captain. However, on the 700th anniversary, the passengers all receive a free drink. Does that imply that they have to pay for everything else? If they do, on what can the money be based on, and how do they earn it? Is there any information about this, beyond pure speculation? 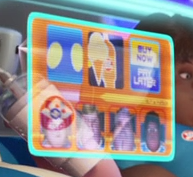 At 0:41:12 in the film the console hologram shows that in-ship purchases have the option of "Buy Now, Pay Later". This image is displayed several times at the food court and in a long-shot over the "shopping district" a few seconds later. As a generational ship, it makes little sense to maintain the same kind of cash-based economy, especially when consumption has been fairly uniformly controlled (cupcake in a cup, anyone?). It seems likely that when special order A-113 was given ("stay the course") the ship cancelled cash transactions and has simply been keeping running accounts for each person from birth until death. Since no-one is actually working, since everyone has unlimited leisure time and apparently unlimited access to all products and services (yet produce nothing of value) there's essentially no working economy as you or I would understand it. If it wasn't for the fact that the ship is cannibalising itself, this would be the perfect communist utopia. We know they had an economy of some sort (Valorum provides an image in their answer with evidence), and we also know that there must have been some form of capitalism on Earth around/up to the time of departure (Buy n Large had bought most of the world's countries and ran pretty much everything). This is given further credence by the Axiom being the "jewel of the fleet", which could imply that the wealthy could afford access to better ships than others. This is merely speculation, but given that robots do virtually everything (and BNL already owns everything), I would venture to say that anything remotely capitalist post-departure is out. Combine this with the fact that they do use money, and we're looking at an economy that likely gives a monthly wage to everyone, who can then choose what to spend it on (to prevent people from just hoarding everything they want for "free"). I'm sure there's a name for this kind of future hypothetical economy, but I haven't found it in my searching. It has aspects of post-scarcity combined with basic income of some sort, but it's not socialist/communist, as there is a sense of property/ownership, the resources aren't communally managed, and there is no labor involved. Not the answer you're looking for? Browse other questions tagged economics wall-e or ask your own question.